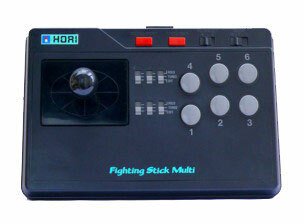 Compatible with most 16bit systems (Sega Genesis, Super NES, NEC PC Engine, etc), this Hori Fighting Stick Multi, with its six buttons, turbo and slow function, however, is a lower quality than previous models from the same manufacturer. Definitely not the first choice for Neo Geo owners. Made by U.S. manufacturer M.A.S, this hardware uses professional materials used in arcades in the United States. If you love the sensations delivered by tough arcade panels, this baby is made for you! Featuring concave buttons and a gum joystick, its grip feels radically different from SNK and Hori sticks. Great quality build and robustness for sure, but also pretty high price, since depending on the version, prepare to pay more than a hundred dollars for it! 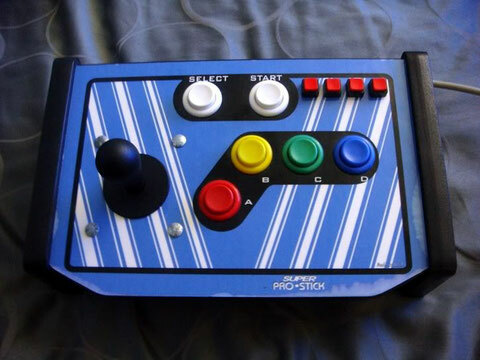 Model/Year Pro Stick NeoGeo/ ? 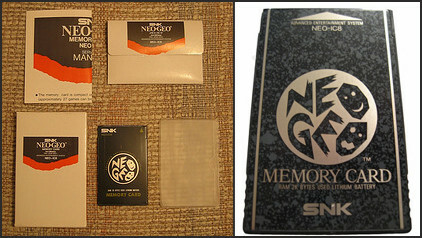 Released in 1990 along with the MVS at first, the SNK Memory Card is compatible with the arcade hardware and the AES, allowing players to save their parties on the terminals packing MC slots, and/or at home on their own systems. 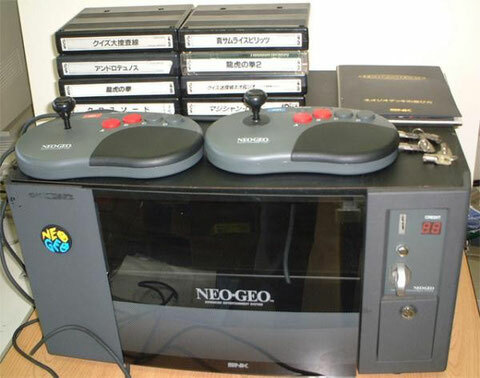 First machine in history to feature a memory card, the Neo Geo innovated with this revolutionary accessory that allowed to save progress and results in games. Equipped with a 2kb memory and a lithium battery (lasting for decades! ), its reliability was never at fault, say old gamer... Essential for any player who wants to finish his games! Product manufactured by a totally homebrew talented amateur, the NeoSaveMasta exists in versions V1 and V2. V2 presented here has the same architecture as the SNK Memory Card, except that they embark 32kb of memory instead of 2! These can contain hundreds of backups, let's say the entire Neo Geo games library, or almost! A nice accessory with a minimalist design for sure, but we can only recommend it, as it is the perfect memory card. To order yours, visit THIS WEBSITE! 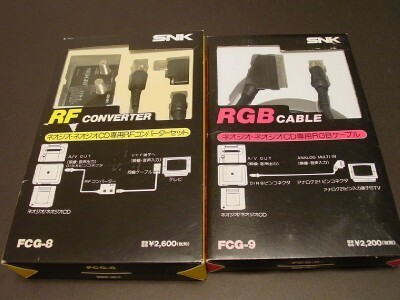 If RGB cables for the Neo Geo can be found all over the planet, the official SNK cable is the only official cable of this type. U.S. and EURO consoles were delivered back then automatically with an RGB cable, and it was intended for the Japanese market or imported console owners. Its signal quality is good, but quality custom-made cable offer the same visual performance. RF cable on its side, allows to view the image through the antenna cable, providing an image of much lower quality than RGB, but useful for people with TV without SCART or RCA plugs. 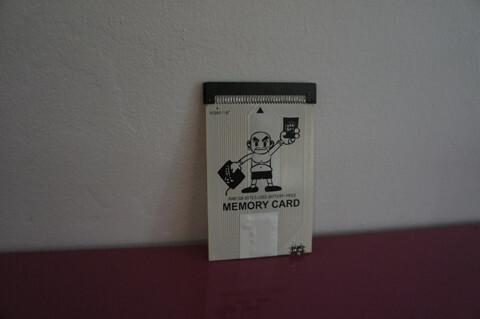 A very nice accessory for players, more than collectors! Made by! Arcade! 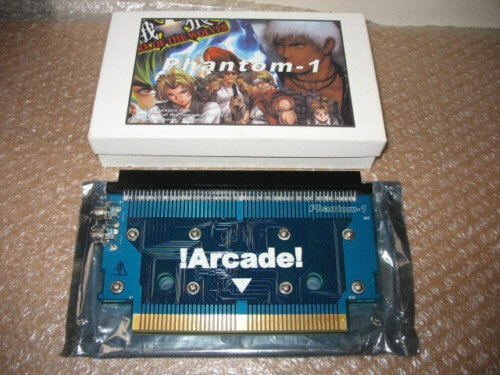 under SNK license, this adapter allows you to play MVS games on Neo Geo AES. Much cheaper than making (or buying) conversions, this one allows among others to play games such as Blazing Star or Metal Slug without selling organs for it. It also allows AES owners to play games released only in MVS version, like Zupapa, Shock Troopers, or Prehistoric Isle 2. Only downside, some games in certain versions do not work or have bugs, but these are rare cases with certain systems only. - Micomsoft's X-NEO1: Box to transmit the image of the Neo Geo by S-Video, or VGA on a PC monitor. - Neo Geo Hotel Unit: a SNK manufactured product, not really a "hardware" as we mean it, but cool enough to be mentioned: It's a dedicated TV stand designed to use a Neo Geo!